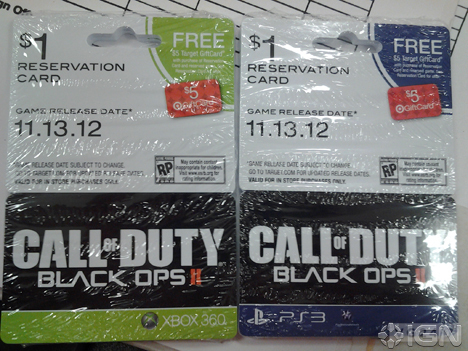 A shot of Call of Duty: Black Ops 2 pre-order cards has been sent in to IGN showing a release date of November 13. The cards pretty much confirm the name of the title, as well as the date, both of which have been the rumor du jour for over a month now. Earlier this week, a viral video FPSRussia suggested the game will take place some 10-15 years in the future, and a logo for the game on the CoD website mentioned Tacitus, along with many other flashing “classified” items. A mock up of the website background and the logo on the cards has popped up on AGB. For fun, we’ve used it as the header image. The game is set for a formal reveal on May 1 during the NBA Playoffs Tuesday night.